Replied by mrmagik on topic Wanna Make Me Super? Replied by paulsamiga on topic Wanna Make Me Super? Dang it! I take one week off from checking the forums and look what I miss. Any Hoo Wellcome Lindsay to our little place on the interwebs. Replied by Lindsay on topic Wanna Make Me Super? Thanks so much for your warm welcome. I've had a lot of fun here already and enjoyed an amazing story from Castor (read it if you haven't!) I think I've sorted through the initial rush of PMs ^^ But I'm sure I missed a couple of people. So if you got in touch before and didn't hear from me, or if you're seeing this now and want to say hi, feel free to PM. I'll see where we can go from there. Thanks again! This has been a lot of fun. I feel super already...! Replied by ong76win2 on topic Wanna Make Me Super? Great to hear that you enjoyed being here and feel super Lindsay. Welcome and thanks for accommodating us all here. 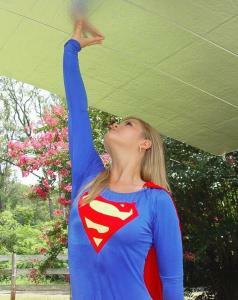 Thanks for being Super! Replied by argonaut on topic Wanna Make Me Super? I've just submitted Chapter 8 of "Baker's Dozen," so it should be in the Library soon. It took me a while, but I've finally added Lindsay to the cast of the story. I tried to make the Lindsay character someone the real Lindsay can identify with, and I hope she's pleased with the result. Thanks for being the muse for this chapter, Lindsay. And don't be a stranger! Replied by oogber on topic Wanna Make Me Super? Great news! I love Baker's Dozen! I seem to have missed this thread back when it got created. I notice Lindsay's post count is really low. Any idea if she's still with us? Replied by Dr. Muttonchops on topic Wanna Make Me Super? Replied by Woodclaw on topic Wanna Make Me Super? argonaut wrote: I've just submitted Chapter 8 of "Baker's Dozen," so it should be in the Library soon.